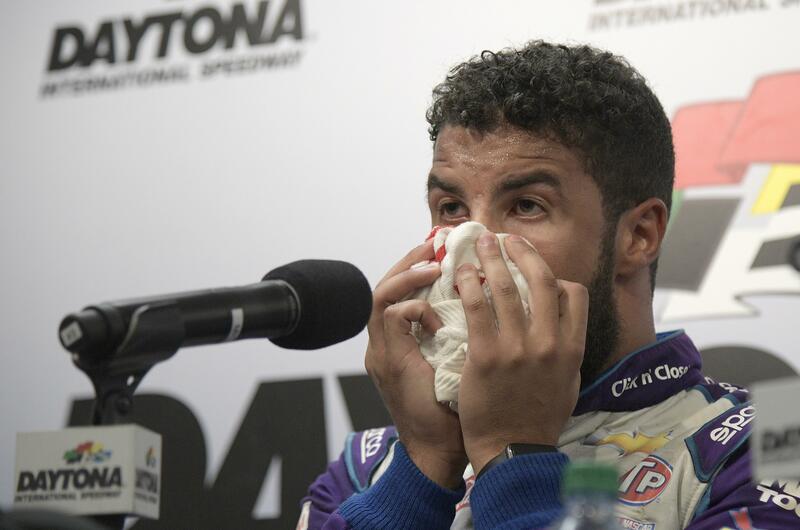 Sun., Feb. 18, 2018, 8:01 p.m.
DAYTONA BEACH, Fla. – Darrell Wallace Jr. let the weight of his milestone in the Daytona 500 wallop him once he saw his mom. He sobbed as Desiree Wallace bounded onto the dais and wrapped her arms around her son for a hug neither wanted to end. Wallace’s runner-up finish in the No. 43 Chevrolet to Austin Dillon in the Daytona 500 suddenly felt like a checkered flag. “You act like we just won the race,” he said, laughing. “We did win that race, baby. I love you. I’m so proud of you,” Desiree Wallace said. His brief moment of levity gave way to an embrace with his sister Brittany, who as child coined the “Bubba” nickname that has stuck to this day for Wallace. “There’s no good story about it,” Brittany Wallace said, laughing. Wallace bawled some more into a towel before he finally composed himself. Wallace carved a slice of NASCAR history Sunday night in only his fifth career start when he posted the best finish by a black driver in the Daytona 500. Wallace was the first black driver to start the Daytona 500 since Wendell Scott in 1969. Scott was 13th in the 1966 race, the previous best finish for a black driver at Daytona. Wallace, the son of a white father and black mother, was feted by sports royalty on his big day, and not just from his team owner, Richard Petty. Baseball Hall of Famer Hank Aaron wished him luck on a phone call and four-time Formula One world champion Lewis Hamilton tweeted his support. RPM majority owner Andrew Murstein surprised Wallace before the race when he told him “Hammerin’ Hank” was on the line. The 24-year-old Wallace was one of the stars of Speedweeks. He topped the speed chart at practice, qualified seventh and was a fixture on social media pushing his new show on the Facebook Watch show page. Fans flocked to him for selfies, and cameras trailed him from pit road to the media center on Sunday to chronicle his feat. Wallace tried to enjoy the moment following an uncertain 2017 when he lost sponsorship and his ride in the second-tier Xfinity Series. He caught a break when he filled in for an injuried Aric Almirola in four races for RPM last year, an opportunity to led to full-time ride this season. He handled the pressure with ease – until he collapsed in tears in the presence of family. Mom had a brief scare when she thought Wallace was involved in a late-race wreck and was tagged into the wall. Then she got lost on pit road and was late to the media center. But now, it’s party time. “He’ll probably want a Domino’s pizza or Goldfish,” she said. Wallace hinted at family turmoil the last two years, one reason why the tears could not stop flowing. But with his mother and sister by his side, Wallace knew his two biggest fans were still in his corner. “I knew it was just a matter of time. He worked so hard to get there,” Desiree Wallace said. “I’m so excited for him because we’ve just been through so much the last couple of years. He’s done so much trying to prove himself to everyone. Published: Feb. 18, 2018, 8:01 p.m.